A team from the US DoE’s Oak Ridge National Laboratory has developed a moldable thermoplastic polymer made with 50% renewable content from biomass, which could replace the polymer currently used in the manufacture of many consumer products, such as car bumpers, kitchen appliances, and even Lego bricks. The research could lead to cleaner and cheaper raw materials for manufacturing, and reduce demand for the petrochemicals necessary for traditional polymers. The new polymer, acrylonitrile, butadiene and lignin (ABL), is light, strong and tough as it used replaces the usual styrene with lignin, a brittle, hard polymer that helps forms the cell walls of plants. This class of thermoplastic elastomers is based on a solvent-free production process that interconnects nanoscale lignin dispersed in a synthetic rubber matrix, nitrile rubber, to produce a meltable, moldable, ductile and stronger material, while rigid lignin sections provide resistance to deformation and stiffness. The thermoplastic is also recyclable, as it can be melted down a number of times and still retain its performance. The study, as reported in Advanced Functional Materials [Tran et al. Adv. Funct. Mater. (2016) DOI: 10.1002/adfm.201504990], had the aim of developing high-value product from lignin. However, as it is very brittle, the lignin had to be toughened by chemically combining it with the soft matrix. 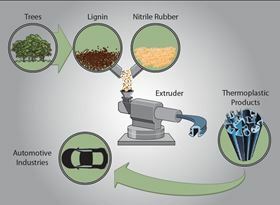 Equal parts of lignin and synthetic nitrile rubber were heated, mixed and extruded. As lignins are not all the same with regard to heat stability, it was important to identify which would make the most effective thermoplastic feedstock, which was achieved by comparing lignin from wheat straw, softwoods and hardwoods, with the last being found to the most thermally stable. The researchers then coupled the preferred lignin fraction with the soft matter in a melted phase. Using a heated chamber with two rotors, they “kneaded” a molten mix of equal amounts of powdered lignin and nitrile rubber. Lignin agglomerates broke down into interpenetrating layers that dispersed well in – and also interacted with – the rubber. The resulting product offered properties between that of lignin and rubber, with a combination of the stiffness of the former and the elasticity of the latter. Changing the acrylonitrile amounts in the soft matrix allowed them to improve the mechanical properties of the material further, including finding the best balance between toughness and stiffness, and improving the performance of the polymer alloy. Biorefineries view lignin as a commercially underutilized plant product, and hope it will help in the production of renewable thermoplastics that can compete with petroleum-derived alternatives. The team is now seeking to demonstrate the use of these plastics as matrix material for fiber-reinforced composite applications, and carry out further exploration into different feedstocks, as well as correlations among processing conditions, material structure and performance. The Institute for Advanced Composites Manufacturing Innovation, IACMI, has formed a partnerhip with molding specialist RocTool. AZL Aachen GmbH is developing new ways to use thermoplastic tapes in injection molding. Bond-Laminates GmbH has received a JEC award for adding tape reinforcements to thermoplastic composite sheets.